In November 2010, PRI started a three‐year project, co‐funded by the European Union, to counter torture in prisons and other places of deprivation of liberty in nine former Soviet Union countries. One of the project’s objectives was to holistic and comprehensive programmes of rehabilitation based on existing models of international good practice, and in November 2011, project partner Freedom from Torture delivered a five-day training programme on behalf of PRI on holistic rehabilitation for survivors of torture. This case study builds on the discussions around the principles of holistic rehabilitation which emerged during the training programme. 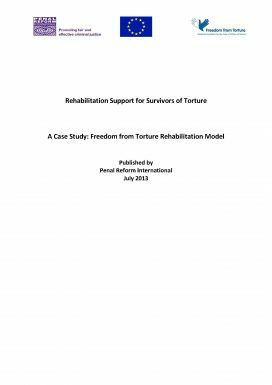 The framework and principles outlined by Freedom from Torture in this document are not intended to be promoted as the only effective model of rehabilitation. Instead, the aim is to share the organisation’s current approach to rehabilitation in order to promote dialogue and share learning from the project.